Halla Kalmansson is not your average teenager. While many students her age are out living a lifestyle of partying and being rebellious, as a freshman music major at Southwestern Adventist University, she’s living one that will actually help her benefit and succeed in life. Born and raised in Leominster, Massachusetts, Kalmansson was born into a life where music was always strongly integrated into her life. At only 18 months, she performed her first church solo. Being the third of four children, she had a happy childhood. She went to a private school from grades one through four, but she never really liked it. In her opinion, school wasted too much time. That is when she decided to be homeschooled. As a young child, Kalmansson aspired to be an artistic painter when she grew up. Her parents supported her in achieving her dream and got her art lessons. As she got older and she drew closer to college, she decided to pursue a career in music because music was always what made her happiest. Kalmansson decided to come to Southwestern when she became a scholarship finalist and won a scholarship for music during last year’s music fest at Southwestern. She was only a junior in high school, yet she was determined to go to Southwestern in the fall. She finished high school in five months so she could attend Southwestern. When Kalmansson came to Southwestern, she didn’t know anyone except Jonathan Wall, professor of music at the school. She had lived in the same place all of her life, so her first few days at Southwestern were difficult for her. Still, it didn’t take her long to make friends. 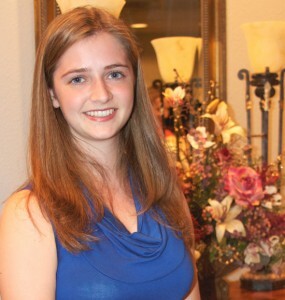 Performing and conducting are her top choices for what she will do with her music major. She also sees herself teaching children or even college students’ music after graduation. When asked where she sees herself in ten years, she says she wants to be living in the North and teaching music. “Being successful is doing what you love and being happy with your life,” says Kalmansson.